Wedding ceremonies French Polynesia are now legal for visitors! 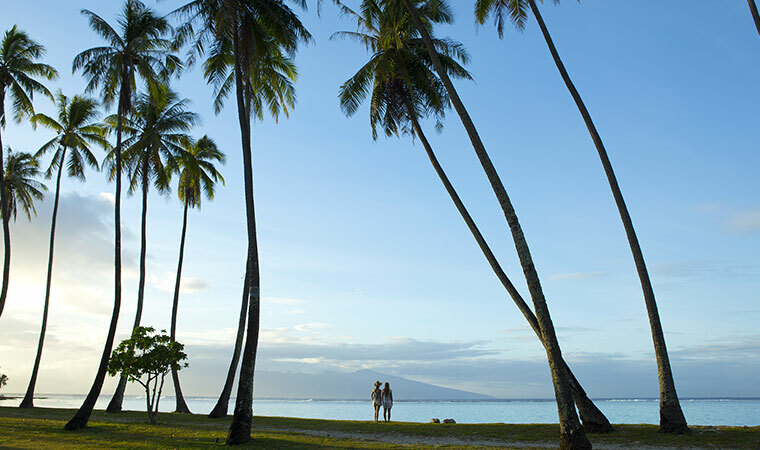 Cruising2Tahiti.com offers wedding packages for guests booked on a cruise vacation or land package in Tahiti. Below is a outline of packages we offer inexpensively for the island of Moorea, just 30 minutes from Tahiti! Upon their arrival at the Tiki Village the couple is greeted by a festive band of local musicians and Polynesian dancers. The bride is then escorted to the ceremonial hut where she is prepared for the wedding. Inside the hut she is massaged with Monoi and dressed like a Tahitian princess. Meanwhile the groom is taken by canoe to a small beach where he is prepared for the ceremony. While on the beach the groom is tattooed (not permanent) and dressed like a Tahitian Chief. Afterwards the groom is returned to the village to meet his lovely Tahitian Princess who awaits him with the Priest and Polynesian villagers for the commencement of the ceremony. Transportation atop a double royal canoe to an authentic Tahitian Village. Wedding conducted by the Chief of the village and the High Priest. Ensemble of musicians and villagers. Leis and crowns of flowers for the couple. A Tahitian Marriage certificate made of tapa. Champagne, Photographs of the ceremony. Transportation back to your hotel. Per couple from $1,300.00 US. The couple arrives from their hotel by canoe and are welcomed by villagers on small canoes. After the ceremony the couple is carried By Polynesian warriors atop the Royal chair and taken on a grand procession around the village. A romantic cruise on the Royal outrigger canoe with an ensemble of musicians and champagne. A massage for two on the royal floating house. Optional complimentary honeymoon night on the royal floating house (breakfast charges apply). Per couple from $1,650.00 US. A choir of Tahitian Mamas singing during the wedding ceremony with a spectacular Tahiti dance show following. A romantic dinner served on the royal floating house. Optional complimentary night on the royal floating house including breakfast brought by canoe. Per couple from $2,100.00 US. The bride and the groom must each choose a witness who must be 18 years of age or older (if the chosen witness is not present, the mayor's office can provide a witness). -The "Marriage of Foreign Citizens in French Polynesia" application must be completed. -A letter signed and dated by both future spouses, addressed to the mayor of the commune chosen for the marriage ceremony. -A certified copy of both spouses' birth certificates authenticated with an "Apostille" (note: the birth certificates must have been issued less than 6 months prior to the date of the marriage). Both of the birth certificates and the "Apostille" must be translated into French by an approved translator and legalized by the French Consulate. Translators can be found on the consulate's website. -A "Certificate of Non-Marital Status" ("Certificat de Celibat") signed by a lawyer, translated into French and legalized by the French Consulate. Lawyers can be found on the consulate's website. -Proof of residency for both of the future spouses (a utility bill or any bill noting names and physical address will suffice). A photocopy of bills for both spouses is acceptable. -Optional, if a prenuptial agreement has been created, it must be translated into French and authenticated by the French Consulate. For More Information Contact a Certified Tahiti Specialist at #1-800-738-8837.